Tonight country superstar Brad Paisley hosted local high school seniors at his tour rehearsals at Saratoga Performing Arts Center in Saratoga Springs, NY. As a special end of the school year surprise, seniors from Saratoga Springs High School and Averill Park High School were invited to come out for the final rehearsal run through as guests of Paisley. The tour officially kicks off tomorrow (Thursday, May 18) in Saratoga Springs. Paisley started the evening by walking out on stage, with iPhone in hand, and told the crowd they were all on Facebook as he was going live at that moment. After some banter with the students about their schools and upcoming graduation Paisley told them, “This is the ‘Last Time For Everything’ for all of you – high school graduation is one of those moments where you look around and it’s like ‘we’re going to be friends forever’ – No - some of them you might see at a reunion,” he chuckled. “Last Time For Everything” is Paisley’s current hit single at country radio. High school seniors across the country have the chance to have Paisley perform for their graduation class by entering the “Class of 2017 ‘Last Time for Everything’ Contest” which will culminate with one fan winning a Brad Paisley performance for their graduation class. Now through May 25, 11:59 pm Eastern Time, fans may submit posts on either INSTAGRAM or TWITTER using the hashtag #BPGrad17Contest with their answers to the question: What “Last Time” are you going to miss most about school? 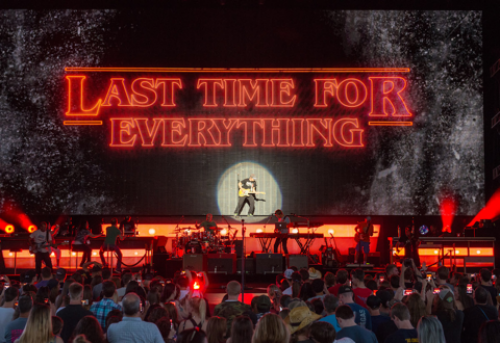 Those interested in submitting posts may draw inspiration from the lyrics of “Last Time for Everything.” Multiple contest posts are allowed, and contest rules are available HERE.